Seokguram Grotto ("Stone Cave Hermitage") is considered to be one of the most remarkable art treasures created by Far Eastern civilization. The grotto is found near the Korean Buddhist temple complex of Bulguksa and it played a vital role in Korean cultural history. Located on Mt. Tohamsan, in Gyeongju, South Korea, about one hour's hike above Bulguksa, the grotto overlooks the Sea of Japan (East Sea) and rests 750 meters above sea level. Both Seokguram and Bulgaksa are the number one destination for Koreans and foreign visitors in South Korea. In 1962, the South Korean government designated Seokguram the 24th national treasure of Korea. 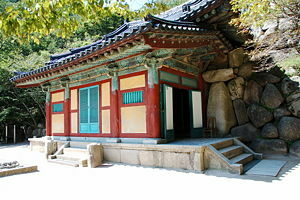 In 1995, UNESCO added Seokguram to the World Heritage List together with the Bulguksa Temple. The single historical reference of Seokguram is in the Samguk Yusa (Legends of the Three Kingdoms), there named Seokbulsa (석불사, Stone Buddha Temple). Gim Daeseong, the renown minister of the royal court who constructed Bulguksa in 751, also constructed Seokguram. While Gim Daeseong carved the circular done ceiling out of rock, it broke into three parts and collapsed. Gim wept uncontrollable, falling into a trance. He saw spirits descending from the heavens, repairing the ceiling. When he came out of the trance, the stone ceiling had been restored. Today the three cracks are still apparent. Gim ceremoniously honored the divine beings by prayers and burning incense. It is said that Gim experienced reincarnation for his filial acts in his previous life. He dedicated Bulguksa Temple to his parents in his current life while dedicating the Seokguram Grotto to Gim's parents from a previous life. Another theory argues that the Silla dynasty constructed Seokguram and Bulguksa to protect the dynasty from invasion. Remarkably, Seokguram and neighboring Bulguksa almost vanished entirely. After the fall of the Unified Silla Dynasty, the center of political power moved north on the Korean peninsula. During the Yi Dynasty, Confucianism ascended and Buddhism fell into disfavor in Korea. Seokguram vanished from sight until Japan rediscovered the site during the Japanese Colonial Occupation of Korea. A Korean postal carrier is credited with the rediscovery of Seokguram, in 1909. Traveling the wilderness area, a violent thundershower forced him to seek shelter in a small cave. To his astonishment, he was looking into the serene face of a perfectly sculpted, gigantic Buddha surrounded by intimidating guardian statues. That chance discovery led to the recovery of Seokguram. Those who have witnessed the beauty and magnificence of Seokguram shutter to think that this stunning artistic and spiritual achieve might have been lost forever. Repair and improvements were undertaken in 1703 and 1758, during the Joseon dynasty. The Japanese Government-General of Chosen conducted restoration works three times, but it faced humidity and other problems. Japanese archaeologists began the recovery of the site. The Japanese Governor Terauchi purported a plan to move Seokguram to Seoul, building a road to transport the stone to the port of Kamp'o. Korean local authorities, suspicious that Terauchi designed to steal the treasures to Japan by ship, refused to cooperate. Unfortunately, the Japanese efforts to restore the site in 1913, led to the destruction of the original foundational stones and the unprofessional use of cement and iron as a base. The cement caused the stones to sweat and water leaks on the dome. Temporary measures using asphalt and tar stopped the water damage. After World War II, in the 1960s, President Park Chung-hee pursued a major restoration project to correct the work done during the Japanese occupation. The interior of the grotto can now only be viewed through a glass wall, installed to protect it from the large number of tourists it attracts. The next major restoration effort came through UNESCO in 1961, when Dr. Plenderlei, from Italy, surveyed the site. An ambitious reconstruction effort by UNESCO commenced, finally completed in 1964. Among the important innovations, UNESCO installed climate control, keeping the temperature constant. A close up view of the entrance. India began a tradition of carving the image of Buddha in stone, holy images, and stupas into the cliff walls and natural caves, exporting the practice to China and then Korea. Since the Korean Peninsula contains an abundance of hard granite non-conducive to carving stone images into cliff walls, artisans had created an artificial grotto from granite. 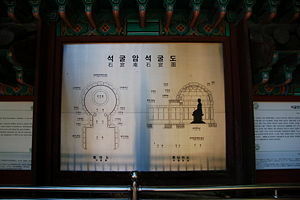 Although the Indian and Chinese influences are pronounced, Seokguram displays unique design techniques, such as the orderly spacing of the figures around the sanctuary. The proportions of the figures as well as the representation of divine and earthly qualities is unique. Scholars agree in the outstanding quality of the artistic work of Seokguram, and many declare the work unparalleled. The entrance foyer is enclosed by a building structure. The small size of the grotto indicates that Silla royalty probably worshiped at the shrine exclusively. The grotto symbolizes a spiritual journey into Nirvana. Pilgrims start at Bulguksa or at the foot of Mt. Tohamsan, a holy mountain to the Silla, walking to a fountain at the entrance of the shrine where pilgrims could refresh themselves. Inside the grotto, the antechamber and corridor represented the earth while the rotunda represented heaven. The basic layout of the grotto includes an arched entrance that leads into a rectangular antechamber and then a narrow corridor, which is lined with bas-reliefs, and then finally leads into the main rotunda. The centerpiece of the granite sanctuary is a Buddha statue set on a lotus thrones with legs crossed in a serene posture of meditation. Fifteen panels of bodhisattvas, arhats and ancient Indian gods surround the Buddha in the rotunda. Ten statues fill niches along the rotunda wall. Artisans built the grotto around these statues to protect them from weathering. Half moons, the top decorated with a lotus flower, decorate the ceiling of the Seokguram grotto. Silla's architects used symmetry and apparently employed the concept of the golden rectangle. The grotto is shaped by hundreds of different granite stones. The structure has been built without mortar, stone rivets hold the stones together. The construction of the grotto also utilized natural ventilation. The dome of the rotunda is 6.84 meters to 6.58 meters in diameter. The statue of Buddha, standing 3.5 meters high and sitting on a 1.34 meter tall lotus pedestal, is awe inspiring. Discussion among scholars about the true identity of the Buddha has been ongoing. Although most consider the sculpture the Seokgamoni Buddha, the historic Buddha at the moment of enlightenment, some consider him the Amit'abul (Buddha of Western Paradise) that rules over the Paradise World after life. The case is made based on the position of the tomb of King Mun-mu (30th King), who unified Silla, that sits in an underwater tomb (Taewang-am) overviewed by Seokguram. He is said to have ordered the placing of his tomb so that his dragon spirit could protect Silla from invasions from the east. Toham-san, where Seokguram and Bulguksa are located, is the eastern mountain of five sacred mountains believed to protect Silla from foreign invasion. Those that consider the Buddha a representation of Seokgamoni point to the position of the Buddha's hands that symbolize the experience of enlightenment. The Buddha has a usnisa, a symbol of the wisdom of the Buddha. Some Buddhist scholars have advanced the idea that the Buddha represents Piroch'ana, pointing to the attendants Chyesok Ch'onwang and Taebom Ch'onwang and the arrangement of attendant figures typcial to the Piroch'ana Buddha. The Buddha statue has been cut from a single block of granite. The left hand rests palm up on his lap while the right hand rests palm down fingers extended on his knee. He is sitting in a lotus posture, his right leg crossed over his left. This position (mudra) of hands is popular with Korean Buddhists, symbolizing peace and tranquility in the face of worldly strife. A sacred jewel spot sits on his forehead framed by finely knotted hair. The Buddha's face is full and round, displaying a softly rounded nose and pronounced mouth. His eyes are gently closed. The whole impression of the demeanor is profound peace and tranquility. The robes draping the Buddha, especially the fan-shaped folds at the crossed-legs of the Buddha, are said to display an Indian influence. Unlike other Buddhas that have a halo attached to the back of the head, the Buddha at Seokguram creates the illusion of a halo by placing a granite roundel carved with lotus petals at the back wall of the rotunda. The pedestal is made of three parts; the top and bottom are carved with lotus petals while the central shaft consists of eight pillars. Accompanying the main Buddha, on the side walls of the rotunda in relief, are eight p'albujung 팔 부중 八部衆 (Eight congregated deities) guarding the entrance. They stand seven feet tall, facing each other across the foyer. As the pilgrim advances into the foyer, two warrior relief inwang (kumgang-yoksa) in martial arts poses confront him. On the western end of the vestibule, walls are Four Heavenly Kings, sach-onwang, considered the kings for the four directions. These kings are Chiguk Ch'onwang (Protecting the Country Heavenly King), Tanmn Ch'onwang (Many Hearing Heavenly King), Chungjang Ch'onwang (Increasing Prosperity Heavenly King), and Kwangmok Ch'onnwang (Wide Vision Heavenly King). The kings are wielding swords while crushing demons beneath their feet. Buddha's ten disciples are on the southern and northern walls. On the south wall are Mognyon, Kajonyon, Subori, Upari and Ananda. On the north wall are Saribul, Kasop, Puruna, Anayul, and Rahura. Kwanseum Posal, the eleven-faced goddess of mercy, is sculpted in relief behind the main Buddha. Many scholars have noted this relief sculpture as an outstanding example of Korean art. Ten nitches high on the rotunda wall house are eight kamshil that remain unidentified. Seokguram holds the attention of even the most casual visitor. For those who appreciate beauty, Seokguram will receive their rapt attention. Most visitors leave the site with an enduring awe and appreciation for the great skill and reverence of the Silla dynasty artists. The Sea of Japan can be seen on a clear day from the grotto. Adams, Edward Ben. 1981. Korea's Golden Age: cultural spirit of Silla in Korea. Seoul: Seoul International Pub. House. This page was last modified on 6 September 2015, at 23:16.